Did the Mysterious Mr. Mullen Become Pescadero’s Richest Man? The Blythe case is only one of many which have sprung out of the influx of population into California during the days of the gold fever. Thomas H. Blythe, or Williams, (his real name) however, made his money here and heirs from abroad. In the case of Edward Mullen, the peculiarity seems to be that he left a prospective fortune behind him, and has just reached the conclusion that nearly forty years of life on a California ranch have not left him a millionaire. ago. after living there thirty-four years, he still retains possession of the ranch, which he values at $6,000. ary 6, 1826. 1 have a sister, the only other surviving heir, who lives at 1310 North Chester Stree!, Baltimore, Md. Her name is Mrs. Mary A. Dulin. Mr. Mullin’s. claims through Edwin Mullin to the property at Long Beach, Cape May, commonly known as the Monroe estate, and stated that Charles Evan Merrit’s attorney, of Mount Holly, N.J., had undertaken to push the case in the New Jersey courts. The attorneys frankly stated in this communication that the length of time which had elapsed since the estate was settled in Edwin Mullin’s time would complicate the suit and delay the present settlement, but they were the same time hopeful of a favorable issue. Mr. Mullin is a hale old man and looks ten years younger than he really is. There is nothing of the visionary or enthusiast about him and his papers seems to fully substantiate his claim. In the headline it should ask if Mr. Mullen became the richest Pescaderan, as he was the one seeking the long dead Mr. Blythe’s fortune.[ed. I got the headline wrong and just changed it.] Though, he never got them as far as I can tell. More likely he was being milked by pie-in-the sky lawyers who knew the letter was a forgery, but didn’t care. There certainly is no indication in the papers that he succeeded. I haven’t found the resolution of his specific case, but I’ve seen several others in short articles with headlines like”Thrown Out of Court…” This craziness went on for decades. The eventual winner grew up from a little girl to a widow before she finally won. I suppose all this name confusion is appropriate, as the famous Mr Blythe, an Englishman, who became a San Francisco financier and developer, had a different name when he served five years in Botany Bay before coming to America. More on that soon. In the early 1870’s, a San Diego resident by the name of O. P. Calloway became interested in the possibility of sufficiently controlling the waters of the Colorado River, through a system of levees and canals, to bring under cultivation a large flood plain lying some distance upstream from Yuma. This is the area now known as the Palo Verde Valley. Calloway made some preliminary surveys and apparently filed some claims on land. But, lacking sufficient funds to carry out his plan by himself, he managed to get interested in the project a wealthy San Franciscan by the name of Thomas Henry Blythe. Blythe had come to California in 1849 from England. In late 1850 and early 1851, through the purchase of two quit-claim deeds for the total price of slightly over $2,000, he had acquired a triangular-shaped, blocksized parcel of real estate located amid the sand dunes in the northeastern portion of the San Francisco peninsula. This area afterward became the heart of downtown San Francisco and this single piece of property, which came to be known as the Blythe Block and which was bounded by Market, Geary, and Grant (then Dupont) streets, made Blythe a millionaire. From this beginning, he went on to acquire interest in a number of mines in California, Nevada, and Arizona, as well as some timber land in Oregon. Rather eccentric and something of a recluse, he travelled to Europe several times, but otherwise spent most of his time living in a cabin in the Trinity Mountains, at least until the mid-1870’s when he returned to San Francisco to reside. Soon after getting Blythe interested in his project, Calloway was killed by Indians along the river. Blythe’s interest, however, not only continued but it grew. His first claim on land along the river, made under the state’s swamp and overflow law, was for about 40,000 acres. He also filed a water claim on the river and may have been the first person in the state to do so. Shortly afterward, he, or rather numerous people acting for him, filed on over 35,000 acres of additional land in this area, this time under the Desert Land Act of 1877. He also made another filing on Colorado River water. A little later, he filed on nearly 100,000 acres of additional swamp and overflow land and made yet another filing on the river. While there may have been a certain degree of overlapping, altogether he seems to have claimed a total of about 175,000 acres of land in this area and his filings on the river to have totaled nearly 400,000 miners’ inches of water. During the late 1870’s and early 1880’s, he reportedly spent almost $90,000 trying to bring these lands under cultivation. Although he was not successful, because of his early efforts, when the Palo Verde Valley finally was developed in the early twentieth century, its principal town came to bear Blythe’s name. By that time, however, Riverside County had been formed and the area was no longer part of San Diego County. After two or three years, the hemp operation failed and most of the company’s shareholders became disillusioned with the venture. But not so Andrade. And not so another shareholder who had later been brought into the company, Thomas H. Blythe. Andrade and Blythe now reached some kind of oral agreement. They not only proposed to keep the venture going but to greatly expand the scope of the whole enterprise. 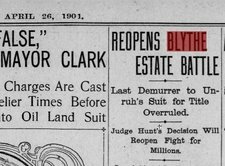 Blythe was to supply the capital. Andrade was to supply his time and effort, his Mexican citizenship, and his not inconsiderable influence with the Mexican government. As a start, Blythe bought up 90 per cent of the company’s shares, thereby gaining control of the 340,000 acres of land it held. Next, Andrade secured a contract from the Mexican government to build two wagon roads, the money for which was furnished by Blythe. One of the roads ran between Yuma and their company’s headquarters on the lower Colorado, a place called Cuidad Lerdo. The other road ran between the port of San Felipe, on the Gulf of California, and Real del Castillo, then the capital of northern Baja California and the center of gold mining activity. In return for building these roads, Andrade obtained title to approximately 575,000 acres of additional land on the Mexican portion of the delta. One key parcel of land, the Rancho de los Algodones, nearly 48,000 acres lying along the west bank of the Colorado just below the international boundary, was purchased by Blythe from its private owners. Altogether, the two men now held title to virtually the entire Mexican portion of the delta, an unbroken tract of land extending along both sides of the river and stretching from the international line to the Gulf of California. Next, Blythe and Andrade, along with two prominent Mexican political figures, one of whom, Manuel Romero Rubio, was President Diaz’s father-in-law, formed a second company and acquired title to the islands of Tiburon, San Esteban, and Angel de la Guarda. They also acquired the lands surrounding practically all the feasible port sites in the northern half of the Gulf; obtained concessions for fishing, pearling, etc. ; established a steamship line; and secured a franchise and subsidy to build a railroad from the head of the Gulf to connect with the United States. In all, they acquired about one and one-half million acres of land and almost complete control over the entire northern Gulf region. Blythe’s estate, exclusive of the Mexican holdings, was worth between $2,000,000 and $3,000,000. Although Blythe’s attorney, W. H. H. Hart, claimed that Blythe had made a will, and produced an office copy to prove it, no legally admissible will was ever found. For a man of such wealth to die without leaving a will was bound to bring about extensive litigation; yet no one could have foreseen the legal snarl that actually came to pass. Nearly two hundred aspirant heirs from various parts of the United States and the United Kingdom filed their claims with the San Francisco probate court. It was to take seven years before the court made a preliminary award of the estate; ten more years before that award was conclusively upheld; and an additional thirteen years before law suits emanating from the estate were ultimately settled. Both state and federal courts were used. Some thirty appeals were taken to the California Supreme Court and four appeals reached the U. S. Supreme Court. Blythe’s illegitimate daughter, Florence, the eventual sole successful heir to his estate, spent an estimated one million dollars winning the case. The heiress was living in England and only ten years old when her father died. By the time she collected the inheritance, she had grown up, married, and become a widow. Fortunately, throughout the long hassle the Blythe Block continued to appreciate in value. There were a number of rather sordid aspects to the struggle for Blythe’s estate. One of the claimants, Nellie Fermin, was an ex-mistress with whom Blythe had had a nasty legal battle, a few years before. Another claimant, Alice Edith Dickason, had been living with Blythe for several years prior to his death. She claimed half the inheritance should come to her as his common-law wife. Unfortunately for her, since she was much younger than Blythe, he had usually introduced her as his niece. Therefore, in the eyes of the law, he was her common-law uncle, not her husband. It also turned out from the various court proceedings that Blythe’s name was actually not Blythe at all, but Thomas Henry Williams. This entry was posted in Edward Mullen, John Vonderlin and tagged Edward Mullen, John Vonderlin. Bookmark the permalink.